Results from high order of collagen fibers oriented at approximately 55 degrees to the magnetic field. The artifact is the increased signal, which in many cases is a desirable effect. 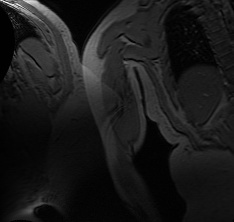 However, when imaging structures of normally low signal intensity such as tendons of the rotator cuff or ankle, 55 degree artifact, also known as "magic angle" phenomenon produces high signal, which may be mistaken for pathology in these structures. The artifact is a problem on short TE sequences (T1, PD, some GRE sequences). 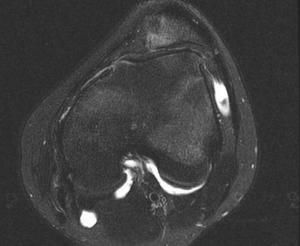 This artifact disappears on long TE sequences (T2), where high signal intensity in tendons may represent pathology. Magic angle artifact is most troublesome in the joints where tendons demonstrate angulation, such as in the shoulder and ankle. Pulsation of the heart, vessels and CSF results in pulsation artifact. 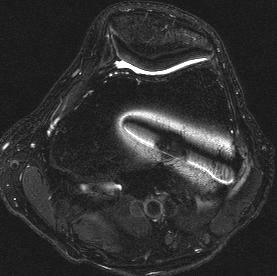 Ghost images of the vessels or vessel walls are seen along the phase encoding direction. Changing the orientation of the phase encoding may result in better delineation of particular anatomic structure. Motion artifact results from patient motion. Keeping the patient calm and comfortable and avoiding long acquisition times are strategies that help reduce this artifact. Various filters maybe available on individual MR units.